The best parts of the weekend newspapers are the reviews. This fits with Saturday and Sunday as a time to escape from news and current affairs. The reviews that appeal to me are those in the supplements of Saturday’s Times, the same day’s Belfast Telegraph, and Sunday’s Observer. Reviewing has become an art form. Everything is reviewed and previewed from holidays at home and abroad, the latest releases in music, films, theatre, art galleries, festivals, walks to try out, family things to do, wines to buy, and of course books. I have to admit that before I retired, reading novels was not my number one pastime. The pursuit was limited to occasions away from the usual routine such as being on holidays or perhaps at a conference. Preoccupied with work, raising a family, paying bills, running marathons, organising community projects – there just were not enough hours in a day. In retrospect, these excuses for self-deprivation are feeble. Compared to my wife who has always been a voracious reader – she recently raced her way through the 1300+ page Tolstoy classic War and Peace – I have little claim to being a bibliophile. What I did read were the national and local newspapers, athletics magazines, and easy to read novels by authors like Jeffrey Archer and John Grisham. Textbooks to do with work also made an occasional appearance. Now, however, that has changed. A peripheral activity has become a hobby. Having discovered the satisfaction of always having a book or two on the go, I have become aware of what I was missing. Buoyed by a regular fix of being enthralled and sometimes overwhelmed by a great narrative, I now set a modest objective to read a minimum of one book a month. Among the results is that every year the objective is surpassed, new authors are discovered, as different styles of writing emerge like wonderful discoveries. There is no better feeling when being so involved with a story-line that impatience compels the reader to catch up with the plot and characters without delay. The more absorbing the book, the more I am carried to another world. The experience is similar to that achieved by beautiful music. Books add to variety and colour to daily life. Each different story creates its own mood and place. Every tale presents a new subject matter and style. Whereas most of my selections are fiction, a number are factual. Some of the most convincing are fiction but based on the real world. Books are also a diversion and a distraction from daily routine. It is a moot point that burying the imagination in stimulating literature can benefit participation in activities like work, volunteering, family events, keeping fit, evening classes, attending concerts, and even holidaying. The big question is how to pick the next book. I suspect that most people avail of a range of influences. Apart from the weekend supplements, I rely on recommendations made by friends and family. It is also easy to be seduced by the lure of titles advertised on and off-line, perhaps best-sellers listings, or by the very presence of books sitting on bookshelves that catch the eye. Here are a few examples selected from my literary liaison. 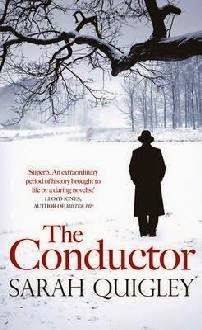 One of the best novels I have read is “The Conductor” written by a New Zealander, and which was the best selling fiction book in New Zealand in 2011. This is a story about the siege of Leningrad which lasted from 1941 to 1944, Shostakovich and the composition of his gigantic seventh (or Leningrad) symphony. War is not a subject that I would expect to capture my interest. If, however, the story is well-written and researched, then novels set in the context of real and awful conflict can stir and shake the emotions. One of this year’s highlights was “The Book Thief” by Markus Zusa, a novel recommended to me by my wife. This is an innovative and moving story about World War 2 from the perspective of a German family and a nine-year-old girl. A discovery from an earlier year was “Exile” written by Richard North Patterson (formerly a US trial lawyer including Watergate). The author had been recommended by a work friend as a superb exponent of legal thrillers, which he is. The beauty of Exile was that it combined the suspense of courtroom drama with the most lucid explanation of the interminable Arab/Israeli conflict. On the subject of trouble spots, two enjoyable books deliver very different and unexpected stories of everyday life in modern Afghanistan. One is “The little coffee shop of Kabul” by Deborah Rodriguez. The other is “The Bookseller of Kabul” by Asne Seierstad. The former is a novel about the coming together of five women in the war-torn city; the latter is a non-fictional journalistic reportage portrait of an Afghan family in the aftermath of the fall of the Taliban. Before dealing with non-fiction, one particular aspect of fiction deserves special mention. Few have not been charmed by Stieg Larsson’s millennium trilogy, Henning Mankell’s compelling stories of Inspector Kurt Wallander have been successfully transferred from book to small screen by a number of rival television companies in Sweden, Norway’s Jo Nesbo is never out of the bestsellers charts, and others including Iceland’s Arnaldur Indridason and the Swede Lars Keplar all vie for our attention. The enigmatic atmosphere of illness, death, insanity, and betrayal has been transformed into the art of Nordic Noir. It was invented for cinema by Ingmar Bergman half a century ago and has become a twenty-first century literary phenomenon. Never has bleakness been so entrancing. So, it was with pleasant surprise that a couple of books from the other end of the emotional spectrum thrust themselves into my line of vision earlier this year, courtesy of the Belfast Telegraph. Here were two interesting titles occupying the upper echelons of the best-sellers lists. Swedish author Jonas Jonasson has proved that northern bleakness is by no means the only style for which his nation should be famed. Since his approach is the polar opposite of angst, I describe his two international political stories “The Hundred-year-old Man who Climbed out of the Window and Disappeared” and “The Girl who Saved the King of Sweden” as nordic blanc (even though the term is not alliterative). They are original, entertaining, funny, and (for added realism) provide a tour of twentieth century world history. Non-fiction can evoke the same strong feelings in readers’ minds especially if the story is narrated by expert journalists. I attended an event in Belfast a couple of years ago when an experienced journalist and Channel 4’s international news editor Linsey Hilsum was interviewed about her experience in reporting from the front-line of war zones. This is an account, often in harrowing detail, about the history of Colonel Gaddafi’s regime, to the shocking massacre at Abu Salim prison and continuing through to how the Libyan people overcame fear and found the strength to rebel. By happy coincidence, a few weeks later, a review by the Observer critic Chris McGreal confirmed my favourable impression. Another non-fiction book that I was persuaded to buy based on good reviews was “The 33” by Jonathan Franklin. This gripping episode the survival and the eventual rescue of 33 Chilean miners had held the world transfixed for days on end in the manner of a major fictional drama. The swift and exclusive reportage of the author was praised in a review by Robert Crampton in The Times. The newspaper headlined it as its Book of the Week. Both newspapers clearly love headline puns and transform book reviews into an art. On which subject, there is another genre of book that I would not have considered without newspaper acclamation – the graphic novel. 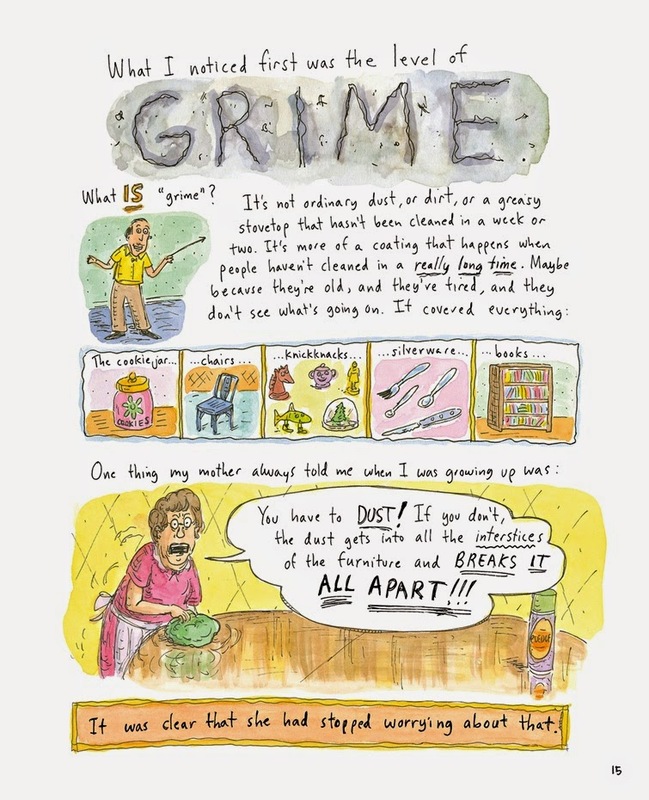 This summer, the Observer’s Rachel Cooke recommended a couple of “graphic novels of the month” (essentially comics for adults) that caught my attention. One was about cycling, the other about ageing. Words and fine art in perfect harmony. 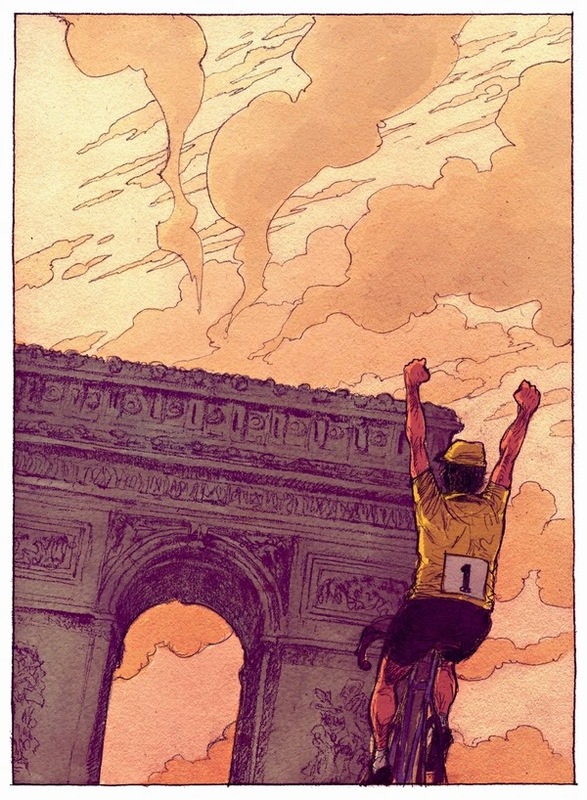 Cycling has become such a growth industry that book sales on the subject seem likely to have probably risen in response. A friend from my gym has recently recommended a book entitled “Faster” by the cyclist and Cycling Weekly journalist Michael Hutchinson. It is about the science and techniques used by elite cyclists in the quest for microcosmic improvements to race faster. It’s waiting in my slipstream, geared up for a hopefully impressive performance. Cooke’s other graphic novel of the month was "Can't We Talk About Something More Pleasant? A Memoir" written by Roz Chast. Chast is a cartoonist in the New Yorker magazine. Sounds like another must-have book. One very special book stands above all of the rest. It features more than 80 actual size reproductions of pages from the original historic masterpiece. 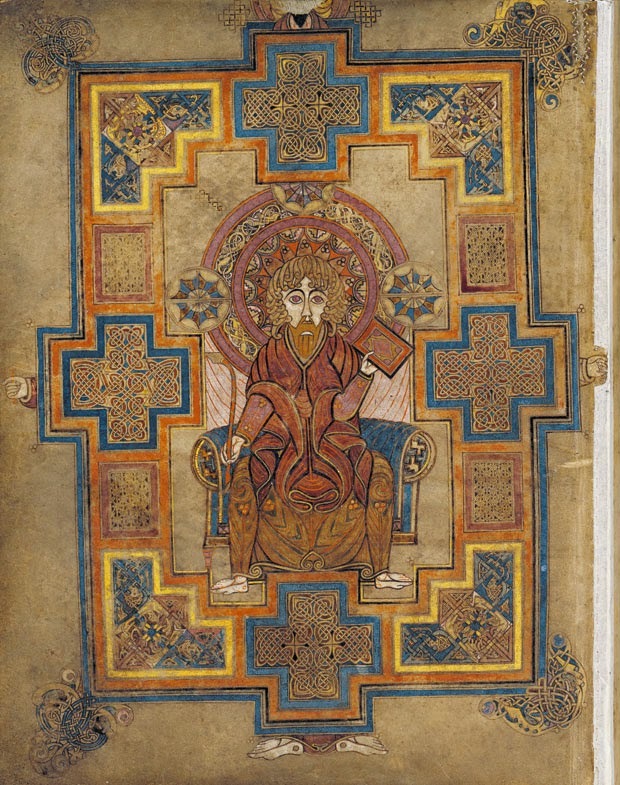 Written in Latin close to 800 A.D., the original book of Kells is an illuminated version of the four gospels, a national and international treasure. Not only is it a magnificent replica, but the presentation inside a hard box-cover adds to its gravitas. I suspect that already it has become a collectors’ item based on receipt of two or more invitations to sell it back. Writing about reading, I have no words left. I am almost breathless. Such is the power of great literature, beautiful books. There is a popular opinion that there is too much sport on television these days. Many use this as one excuse to deprive themselves of unmissable chunks of high quality broadcasting. These people consider that their appetite for televised sport has been satiated by what they regard as a surfeit of events like the Olympics (summer and winter games), Match of the Day, and the seemingly endless stream of sport on satellite TV channels. These critical citizens, many of whom are retired and leading exceptionally busy lives, have additional excuses to justify their self-denial. They have seen, or even participated in, events like the London marathon before. They know all there is to know about the event. If they have not seen it screened live, then perhaps they might, at best, make do with watching the highlights or perhaps limit themselves to edited extracts on news bulletins. They have had enough of the commentary of Steve Cram and Brendan Foster regurgitating the same clichés year after year. And they are definitely not fans of the hyperbole represented as “reality TV,” into which genre they place the televised London Marathon. Their ultimate and killer argument is that they have better more productive things to do on a Sunday morning. There is, of course an alternative position, one which challenges their conventional wisdom. Not being a member of the dismissive school of thought, this advocate proposes a number of reasons in support of the counter-argument. They are listed in no particular order of preference or importance. In the process of marvelling at excellence, the viewer (of whatever age) can find a role model who will encourage and influence positive behaviour, possibly subconsciously. Who can witness athletic prowess and beauty such as that caught on camera on the streets of London on a sunny April day and not be inspired to have a go at some kind of outdoor activity. The very act of watching runners, even at a distance through the prism of a television, can inspire the spectator to get up and go actively. Such inspiration is a joyful contrast to rapacious greed in sport (such as professional players’ wages in Premiership football) and to the nihilism of many other forms of human endeavour, such as the toxic effects of sectarianism. Like listening to live music or watching a gripping new play in the theatre, nothing beats the drama of seeing events unfold as they actually happen. Exceptionally, as happened at the Boston Marathon last year, the spectacle of community celebration and the joy of living can be overshadowed by evil. More usually, however, the narrative relates to athletic rivalry between Kenyans and Ethiopians, supplemented with live-affirming stories from ordinary citizens motivated to participate in memory of ill or deceased relatives or friends. And every year these case-studies are presented in a new and fresh way. All of us can benefit and learn from occasional reminders of the trials of others. Their stories can be humbling to hear. Just as the participating athletes discover their limits of endurance, the tales of the non-professional runners help to put the viewers’ lives into another perspective. As for “reality TV,” in actual fact the real life stories told by charity fund-raisers together with the sight of runners with all manner of disabilities provide irresistible testament to the value of providing space and attention to those who are less fortunate than the majority. It is also a salutary reminder to viewers (especially those who may be sedentary) that people with all kinds of disabilities can take part and compete in what the BBC describes as the world’s best marathon. With the progress in modern technology, the television viewer can see the race in perfect definition and from the best of angles. Such is the quality of picture, that the contemporary TV coverage provides a magnificent free conducted tour of the capital city and its many landmarks. Every year the cityscape is evolving. Inspiring is an understatement to describe the spirit and zest of the participants, never mind the welcoming embrace of Londoners (and the volunteers) for all of the visitors to this great and inclusive city. This is an important subliminal message, relevant nationwide, and beyond. Those who argue that they have no time to watch the London marathon need to trust their innate talent and human nature’s capacity for multi-tasking. It is possible to watch the marathon at the same time as having breakfast, texting family and friends, reading the Sunday papers and taking on a cryptic crossword. In this way all areas of the brain can be active at the same time. For those sceptics and cynics who remain unconvinced at this solid array of axioms, there is always the alternative of watching the 60 minute highlights programme in the evening after dinner when it is dark and gardening is not on the agenda. Another option is the BBC i-player. It may sound slightly paradoxical to say that whereas there is no compulsion to watching anything on television, there are few programmes which exalt the generous spirit of humanity and the joy of life so artistically as the BBC’s coverage of the London Marathon. Television is the most accessible of cultural assets. Nobody is excluded. In the same way that supermarkets lure shoppers with loss-leaders, watching the London Marathon on Freeview might well lead the reluctant viewer to discover hidden gems among other televisual delights. These might include Andrew Graham-Dixon's series "Secret Lives of the Artists," or the London Proms right through the summer into September. If none of this convinces you about the artistic virtue and informative capacity of television, I have an alternative recommendation. Japan’s best-known and prize-winning author Haruki Murakami, regarded by some as a nihilist and described by the Guardian as “among the world’s greatest living novelists,” has also written a couple of non-fiction books. One of them is about his experience of long-distance running and how it prepares him to be a great writer as well as a veteran athlete. His is a memoir not only about long distance running, but just as much about equipping himself for life. As an afterthought, it is also a little about the coping constructively with process of ageing.